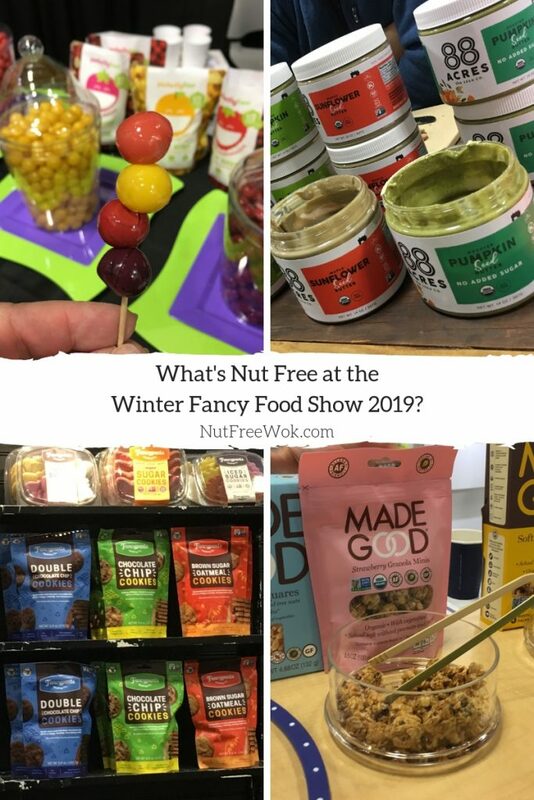 The Winter Fancy Food Show 2019 sparkled this year in San Francisco’s Moscone Center Convention Center. The North and South halls are now connected by a large, bright, continuous space which means more booths to look for tasty nut free foods. 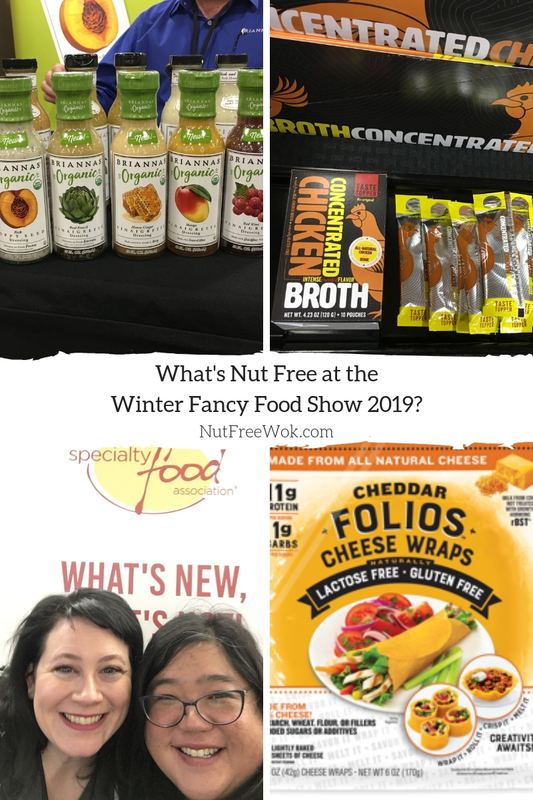 This year is my fifth year in a row to attend the Winter Fancy Food Show #WFFS19 and I spend part of my time catching up with some of my favorite allergy-friendly companies to see what’s new. 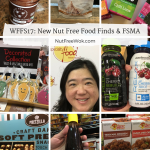 The rest of the time I look for new nut free foods to share with you, and learn more about food manufacturing over 3 days of constant walking, talking, and snacking. 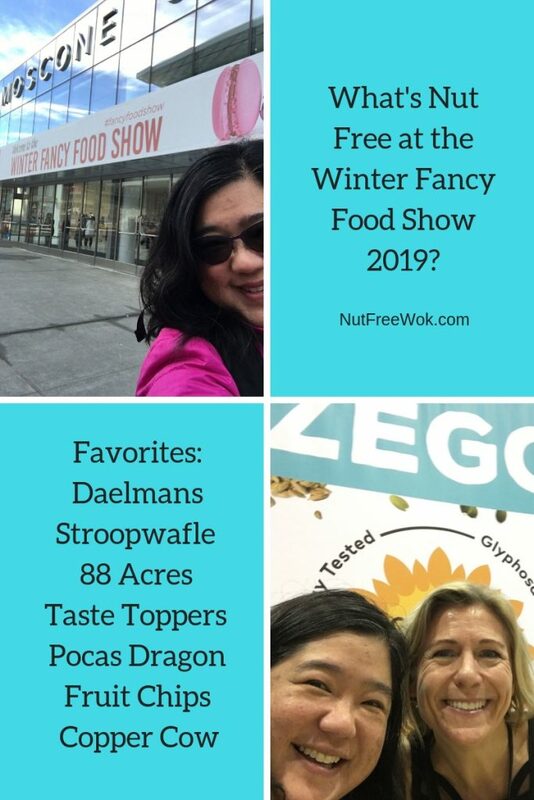 Out of all the new foods that I found, my top 5 nut free food finds are the following: Daelmans Stroopwafle (especially caramel and chocolate-caramel), 88 Acres (chocolate sunflower seed butter, yum), Taste Toppers concentrated broth, Pocas Dragon Fruit Chips, and Copper Cow. Read on for all the details. 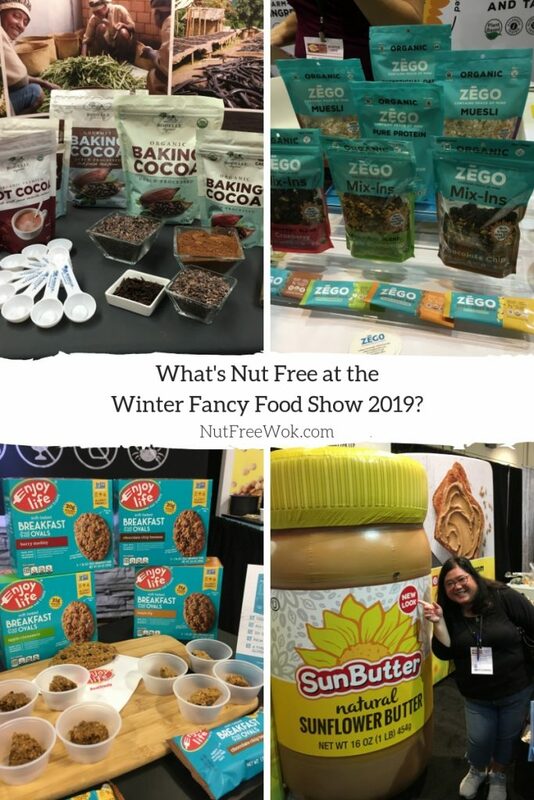 I’m ready and energized to find out what’s nut free at the Winter Fancy Food Show on the first day. I found 5 new nut free favorites. It was a tiring 3 days but loved resting and catching up with my friend Colleen from Zego at her beautiful booth on the last day. Disclosure: I chatted with some of the companies at the show, some of them sent me samples for review. Going to events like this is much like dating, interactions at the show are like speed dates and if I feel comfortable with the companies’ products, they give me or ship samples to meet the family and I have more to talk about. I only share about products that I like, would buy for my family, and share with friends IRL. This post may contain affliliate links. Please be sure that to read ingredient labels and check with food manufacturers regarding your allergens before consuming. What Does “Nut Free” Really Mean? I had some very interesting discussions with companies about whether they’re nut free or not. 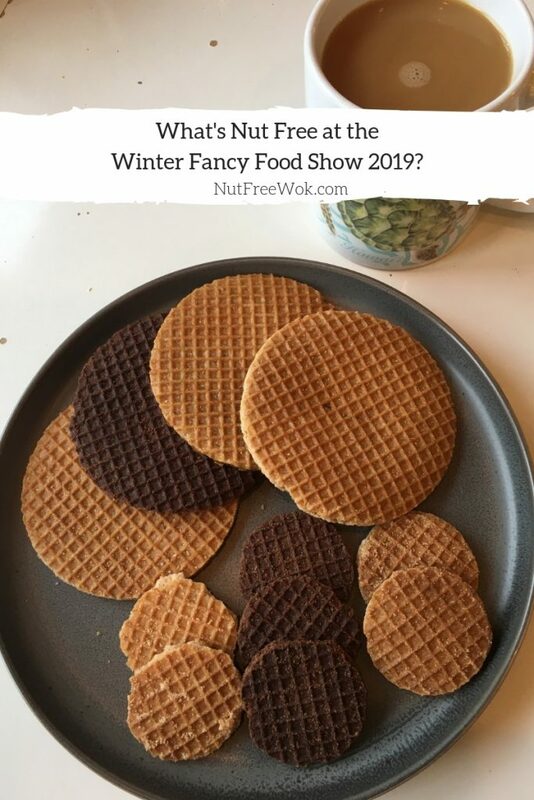 I find that we all have different expectations about what does “nut free” really means and I have to ask follow up questions to be sure that we understand each other. Have you ever thought about what does “nut free” really means? Some people might think that nut-free means that there aren’t any obvious nuts in the ingredients. People with a life threatening allergy to peanuts or tree nuts (or any of their allergens) need to avoid minute traces of their allergen due to cross-contact during the manufacturing process. We might feel comfortable buying a product that’s made in a facility without the presence of peanuts and tree nuts in the facility because if they’re not one of the ingredients in the facility, they can’t be accidentally introduced, right? Remember when hundreds of products were recalled because of peanut tainted cumin or because traces of peanut were found in wheat flour? I love it when companies test their final products or require their suppliers test and certify their ingredients. Food manufacturers are not required to use allergen advisories, so the absence of a “may contain” or “made on shared equipment” or “made in the same facility” type of statement doesn’t mean an absence of risk. It is so helpful when manufacturers include allergen advisories on the package and I also appreciate additional allergen information on websites or helpful customer service representatives. 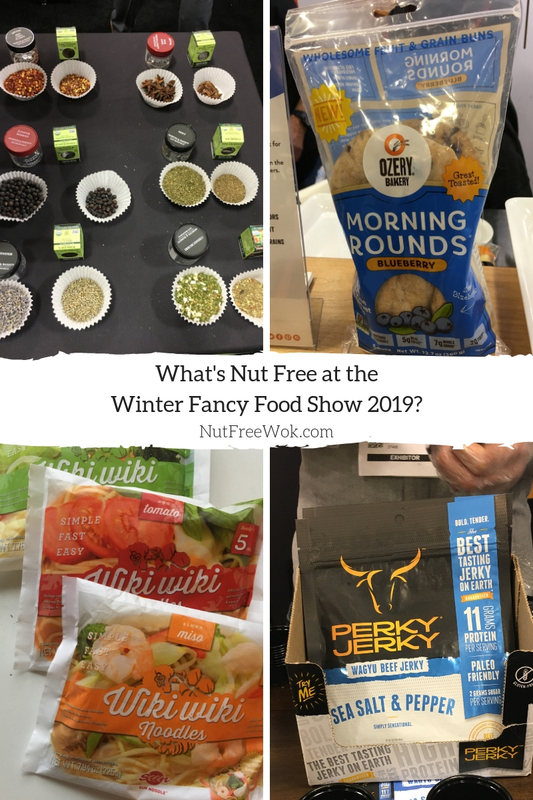 I love to share my favorite food finds from the Winter Fancy Food Show but sometimes it can be an agonizing experience to drill down on whether any food is nut free or not, dairy free or not, gluten free or not, etc.. I can ask questions, risk exsperating everyone (including myself), and still not have all the facts. I don’t know what other allergens you avoid or your comfort level. It’s possible that manufacturers will change their ingredients or manufacturing procedures without notice and the information in this post is incorrect or become out of date. You are responsible for checking whether any of the products are suitable for you and your loved ones before you buy, eat, or serve any foods mentioned below. If you have any questions, please check with your medical care team. 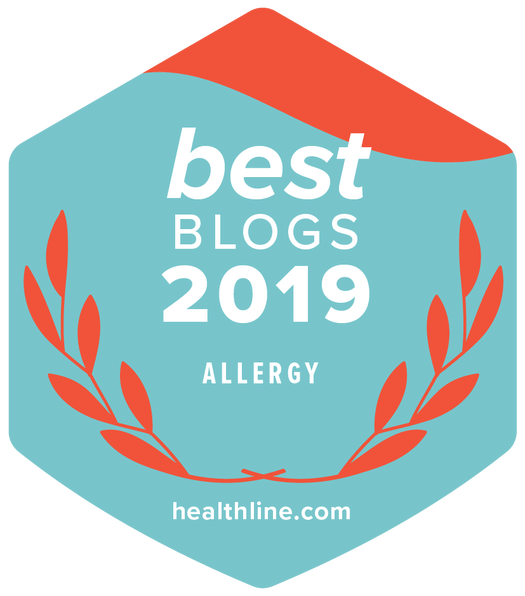 What’s New with Our Favorite Allergy Aware Brands? 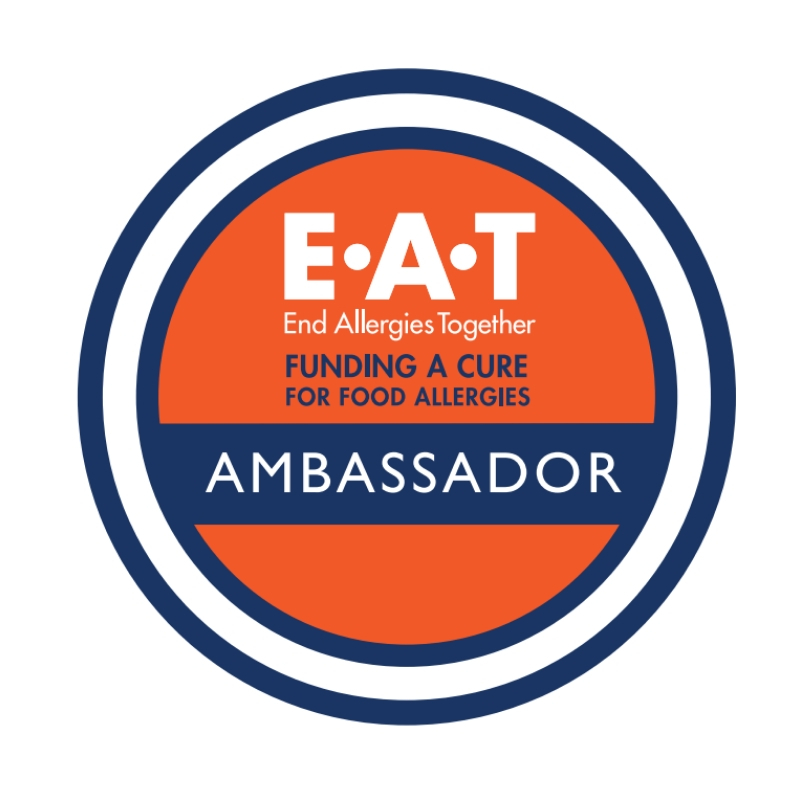 There are some allergy aware brands that we already know and love because they are committed to being in the food allergy space with us and that we would love our grocery store buyers would take note and order for our local stores. These companies are some of my favorites because they’re free from specific allergens, they are transparent in their ingredient labeling, voluntarily use allergen advisories, they have excellent customer service in case we have questions. Enjoy Life Foods – they recently launched a new product called Breakfast Ovals, (affiliate) which are individually wrapped certified gluten free oat muffins in the shape of an oval in four different flavors. The breakfast ovals are a little bit dry at the edges but delicious in the center if you eat them straight out of the package. If you have an extra minute to heat them up in a microwave or toaster oven and add some jam or spread, they are even better. ELF also relaunched their Protein Bites and the texture is much more truffle-like than before. My favorites are the Sunseed Butter (affiliate) flavor, it’s made with sunflower seed butter. I also like the Dark Raspberry (affiliate) flavor, which is a classic combination. I recently found them in snack/travel size packages at Trader Joe’s. 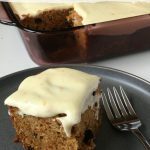 AND Enjoy Life Foods also announced that they are FODMAP certified, which is helpful to know if you have friends who are following a FODMAP diet. ZEGO – their products are free of the top 8 allergens, gluten, and more. Food allergy families would be amazed to know that you can look up the allergen tests for each ZEGO product online or by scanning the QR code on the product. ZEGO is an industry disruptor as they are the only company that I know of that tests for glyphosate and over 400 other pesticides and herbicides. My favorite product are any of the Just Fruit + Chia bars (affiliate). They’ve also added oats, muesili, granola, and a Sacha Inchi protein protein powder, be sure to check out their Kickstarter campaign (readers who pledge $50 or more and mention my name will receive a coupon for 40% off coupon on their next purchase, limited time offer). SunButter – they have a new look, which is helpful to know as you’re scanning grocery store shelves and so you end up with a fresher batch if you order them online (affiliate link). 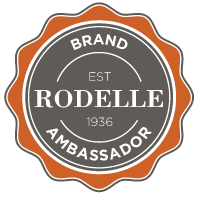 Rodelle Vanilla – I was so excited to meet everyone at the Rodelle Vanilla booth since I’m a brand ambassador for them. They are my go-to brand for vanilla extract as well as other flavors. You know how I like to bake Triple Chocolate Banana Bread because I love Rodelle’s Gourmet Baking Cocoa, which is very dark and rich with chocolatey flavor. I learned at the WFFS that they also have an Organic Hot Cocoa Mix, I cannot wait to try some hot chocolate with some Dandie’s mini marshmallows. I love Rodelle’s Baking Cocoa, I have no doubt their Hot Cocoa i amazing. Zego shows off their new Mix-Ins, Muesli, Pure Protein powder. Check out Enjoy Life Food’s breakfast ovals and Sunbutter’s new look! Dandies – I stopped by at Dandies booth too, it’s so cool that they have pumpkin and peppermint flavors for some special fall and winter treats. I love their all natural marshmallows are free of high fructose corn syrup, free of most top allergens (except soy), and vegan so that we can share rice crispy treats with our vegetarian friends. Be sure to buy them in the blue bags (affiliate link), or orange or red/white striped bags for the pumpkin and peppermint flavors respectively, and avoid the older style packaging. Way Better Foods & Spokes – The two companies have merged, both are nut free, gluten free, and non-GMO. Way Better Foods makes grain based and sprouted seed crackers and tortilla chips, which I’ve blogged about before. Spokes makes air puffed low caloried potato snacks. Each piece is ingeniously shaped like the spokes of a wheel, it takes a few bites and few moments to eat each piece. Free For All Kitchen – Partners Crackers reached out to send me their Free for All Kitchen top 8 allergen free crackers which are also gluten-free, non-GMO, and made with cassava flour and five ancient grains. Their savory crackers are sturdy and great with dips, spreads, and appetizers. My favorite is the Double Chocolate, which reminds me of a brownie crisp. 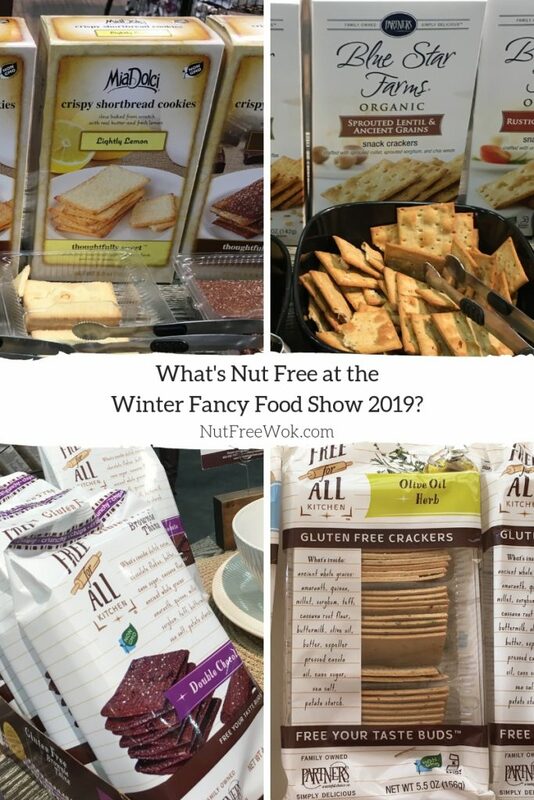 As I looked around their booth, I realized that all of Partners Crackers Brands are made in a nut free facility, which include Wisecrackers, Mia Dolci, Blue Star Farms and more. Perfectly Free – I am still waiting for west coast grocery stores to carry Perfectly Free’s top 8 allergen free Frozen Pints and their frozen mochi-like Frozen Bites, which I’ve tasted at food allergy conferences. They were sharing their latest product: Fruit Bites. Fruit Bites are colorful, marble sized little bites of low sugar fruit purees. They’re not frozen but keep their shape with a gelatin free grape like skin. Fancypants Baking C0.– They make adorable decorated cookies in their nut free bakery. They recently added a new product: Vegan Sugar Cookies which are labeled dairy free, nut free, and egg free and fine for someone who is vegan but they’re made in the same facility and/or shared equipment with milk and eggs, not recommended for someone who avoid eggs or dairy due to food allergies. You can also find their crunchy cookies at supermarkets, check out their new look so you can spot them on your store shelves or online the next few months. 88 Acres Food – I tried their organic seed bars, they’re really very good, slightly moist and chewy, lightly sweetened. I like the Chocolate Sea Salt flavor (affiliate) a lot, I also tried the Ginger Apple flavor too, it’s delicious but the ginger is strong. They also make sunflower seed butter and pumpkin butter that’s smooth, creamy, very delicious, my favorite is the chocolate sunflower seed butter (affiliate). Their dedicated facility is free from peanuts, tree nuts, gluten, dairy, eggs, soy and sesame (and NOT (company #2 mentioned above). Made Good Foods -They make snacks such as granola bars, granola minis, soft baked mini cookies, and rice crispy squares in a dedicated facility free from the top 8 allergens plus sesame. I did not know that each serving contains the nutrients of one serving of vegetables until I tasted their samples however my son didn’t really noticed and his favorite were the granola minis. They use extracts of the following vegetables: spinach, brocoli, carrots, tomatoes, beets, shitake mushrooms. Perfectly Free’s Fruit Bites on a toothpick, 88 Acres sunflower and pumpkin spreads, Fancypants Baking has new packaging and new vegan cookies (top shelf), and Made Good’s granola minis. Snacks and sweets often have a high risk of cross-contact with nuts. Being able to find some snacks and sweets made in a facility without nuts or other allergens is helpful for families with food allergies. Daelmans Stroopwafels – Have you ever had a stroopwafel? 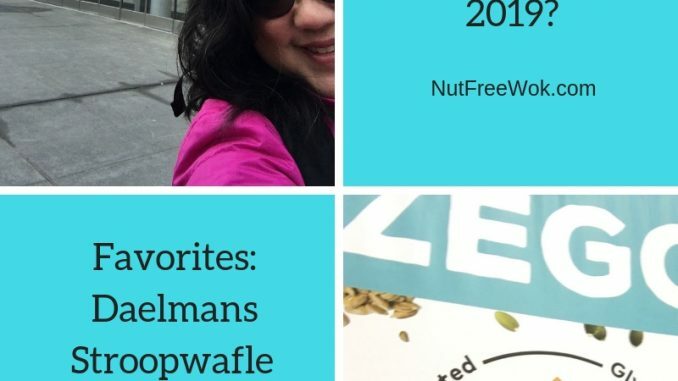 They’re awesome but not all stroopwafels are nut free and I’m so glad Daelmans reached out and sent me some samples to review. A stroopwafel is two crispy waffle cookie layers filled with a layer of caramel in between and you place it on a cup of your favorite hot beverage for a minute. Then the stroopwafel becomes a scrumptious, sweet, melty caramel treat. My kids don’t drink coffee or tea so they microwaved the stroopwafels for 5 seconds, brilliant instant gratification hack! Daelmans Stroopwafels has a variety of sizes and flavors (affiliate) and can be found in local stores. They are nut free, sesame free, and newer packages are egg-free recipe, people with egg allergies need to check the the ingredient labels carefully in case to be sure they have a newer egg-free package. I opened all the packages that Daelmans sent me at the same time to take the photo below and shared the rest with my family and our friends. My family loved it and our friends wanted to know where to buy them, it is definitely a favorite treat. One cup of coffee, so many Daelmans Stroopwafels to choose from: honey, chocolate-caramel, caramel, maple, mini honey, mini chocolate-caramel, and mini caramel! Belgian Boys – They make so many delicious treats, some are made in facilities without nuts but not all of them. Check out their Mini Cookie Stash (mustache shaped cookies), De Liege Wafel and Choco Liege Wafel (sweet Belgian waffle, my sons love these) for some options made in a facility without nuts. I love watching this company grow each year and hope that someday all of their products will be made in a nut free facility. Golden Cannoli Shells – They used to be called Cannoli Chips but they’re rebranded and have a new look. Products in stores will probably transition to the new look in the coming months. They still make nut free cannoli shells, cannoli chips (lemon is my favorite! ), and other yummy sweet treats. Beckon Ice Cream – They make yummy lactose free ice cream (contains dairy, not suitable for someone with a milk allergy), do not use any nuts in any of the flavors. They do not make the ice cream in a nut free factory but because they make lactose free ice cream, they are careful to clean the equipment thoroughly. One of the owners is also allergic to nuts and tries every product, seems like a promising option. Bequet Confections – award winning caramels, dairy is the only allergen in the facility. They are certified gluten-free, kosher, and produced in a nut free facility. I love that the caramels are a nice size so that they are easy to eat and the variety of flavors (affiliate) is excellent. Moon Cheese – My son loves cheese, so I pay attention to cheese products. Moon Cheese is a catchy name, I’ve seen snack sized bags in stores (affiliate) and had no idea they are made in a nut free facility. They are crispy cheese bites that remind me of a crouton. La Panzanella – my sons grew up eating their croccotini crackers and now La Panzanella make them with different flavors and different sizes of squares and rectangles. I recently purchased a package and was amazed by how much they still enjoy them. La Panzanella added a certified gluten free round cracker that’s delightfully light and crispy with an allergen advisory that the gluten free crackers are made in a facility with wheat and other allergens. Bush’s Best – We know this company for their beans and chilis, now they have a line of bean chips, roasted chickpeas, and other snacks. I love that a big mainstream brand is making yummy snacks with beans. Graceland Fruit – they make very delicious dried apples, cherries, blueberries, cranberries, and strawberry that’s organic, non-GMO, kosher, and halal certified in a top 8 allergen free and gluten free facility. Their dried fruit has an exceptional taste and great texture. Pocas Dragon Fruit Chips – these are thick and crispy dried dragon fruit chips that are non-GMO, gluten free, has no transfat or added sugar according to the label. 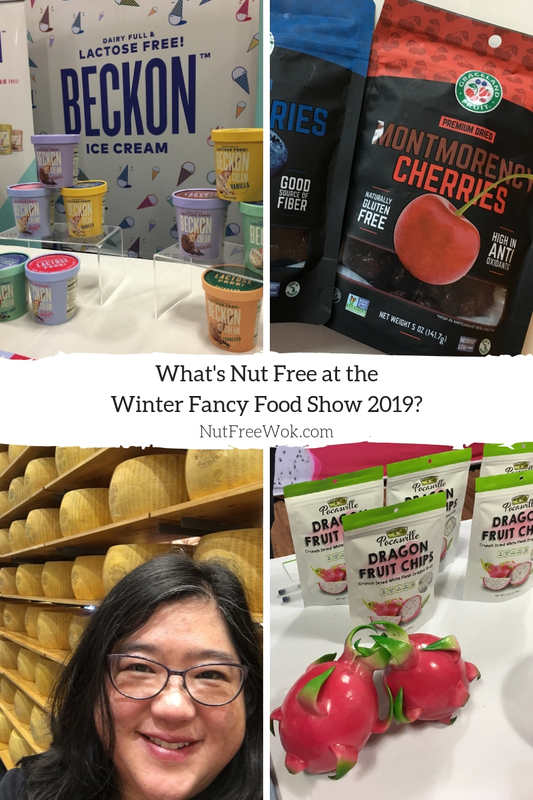 I can’t find any written information that they’re nut free but when I was at the show, the representative told me that they have a facility near where they grow the dragon fruit and it’s the only product that is processed in that facility. I love fresh dragon fruit but it’s nice to have some dried dragon fruit (affilitate) handy for travel when we might need more potassium and fiber. I personally like the red dragon fruit (affiliate) which is naturally sweeter than white dragon fruit. Norm’s Farms – My family started to take elderberry supplements to help us fight off colds and flus during the winter months. 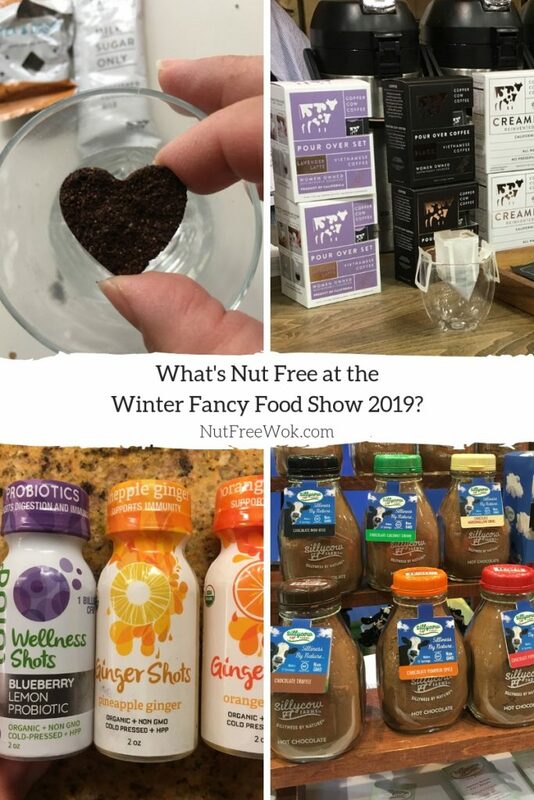 I was curious about the elderberry options at WFFS and learned that Norm’s Farm’s supplements are nut free (affiliate). Because one of their jams contains pecans as an ingredient, their jams are not nut-free and are made in a different facility separate from the supplements. River Hills Harvest – They are an award winning company that make products from elderberries grown in the US. All of their products are nut free and non-GMO. I sampled all of their products at the show and think they taste delicious. They’re available to order via Amazon (affiliate) and on their website. Phillipine Brand – Dried mangoes are nut free and delicious. My kids love it when I buy it from Costco. Beckon Ice Cream (what a great name!) that’s nut free and lactose free (not safe for milk allergies), Graceland dried fruit that’s hardly dry, Sharon standing in front of a giant display of cheese, and Pocas Dragonfruit Chips. Copper Cow – Copper Cow makes portable pour over Vietnamese coffee packs which include a nice sized sweetened condensed milk. It’s brilliant: you tear off the perforated top of the coffee pouch, hang it on top of your coffee cup, slowly pour 5-6 ounces of hot water over the coffee grounds, and then add a squeeze of sweetened condensed milk. They make a Lavender Latte kit, which has a lovely light lavender flavor. They also make Black Vietnamese Coffee Kit which does not include sweetened condensed milk. I also received samples of their Thai Iced Tea drops, which are cute heart shaped tea drops with real tea leaves. Add them to a cup of hot water, steep, add some sweetened condensed milk, and then wait for the tea leaves to settle to the bottom before drinking. Copper Cow makes some wonderful coffee and tea options for those of us who don’t often go to Vietnamese or Thai restaurants. Ginger Shots – Ginger Shots are exactly what they sound like, 2 ounce shots of ginger juice. This company also makes Wellness Shots and Probiotic Shots, which I did not try at the show as I was just focused on the Ginger Shots. The Ginger Shots are organic, non-GMO, and cold pressed so they need to be refrigerated to stay fresh. They have a variety of different flavored Ginger Shots (affiliate), Pineapple Ginger is probably the tastiest flavor. This product caught my attention because I love to add ginger to our meals because ginger supports our immunity and I make tea with ginger, honey, and lemon to feel better. Now I could just make tea with honey and pour a Lemon Ginger Shot in for a delicious and soothing drink. Purity Organics – I love their organic coconut water. Their organic sparkling fruit juices are refreshing and low calories, and they will have two new flavors coming soon, Sparkling Raspberry and Sparkling Lime. Good Belly – They make nut free, dairy free probiotic juice drinks. It’s a great option for people who would like a probiotic drink that’s not yogurt based. Ocean’s Halo – I’ve shared about Ocean’s Halo’s nori snacks and soy-free, nut-free, gluten-free Asian sauces before. This year they have a new line of kelp based superfood drinks which have high levels of iodine and potassium. Strawberry Coconut is one of their flavors so people with a coconut allergy need to check whether the other flavors are suitable for them. One of my sons is allergic to kiwi and aloe, so I will need to check as well. Silly Cow Farms – They make hot cocoa products in a variety of delicious flavors, (affiliate) including a Chocolate Coconut Cream flavor. Silly Cow Farms jars of cocoa are peanut and tree nut free (except coconut), gluten free, and do not contain dairy. My chocoholic son loved it. They do make individual packets of hot cocoa which contain dry milk, so people with milk allergies need to double check if there’s any risk of cross contact between the two different types of packaging. Day-Lee Foods – Day-Lee Foods makes frozen potstickers that are sold in Asian supermarkets. You can also find their Crazy Cuizine potstickers and heat and serve entrees in supermarkets and big box stores. All of their products are nut free, including a nut free General Tso’s Chicken. They will be introducing some new flavors such as Srirachi Chicken Potstickers and Spicy Tempura Cauliflower. Sun Noodle – They make fresh ramen (affiliate, in case you can’t find it locally) for home cooks as well as for ramen restaurants. I’ve purchased their miso and shoyu fresh ramen packs before. They introduced Wiki Wiki Noodles, a new line of Hawaiiian inpired ramen in tomato, miso, and creamy vegetable flavors that are available in the freezer section. Stir fry some fresh vegetables, cooked meat, add water and the ramen kit to make a one pot meal. 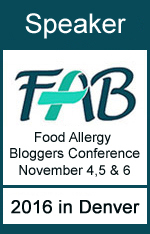 Read the package for allergens and allergen advisories, they use wheat, egg, soy, fish, and sesame in their facilities. Onyx Black Fermented Garlic– I was excited to try Onyx Black Fermented Garlic because I like ramen with black garlic oil and it’s an antioxidant rich food. I plucked off a clove and peeled off the papery skin and the garlic is soft, black, and slightly moist. It is absolutely delicious, soft, sweet, with a bit of a tang and none of the sharpness of raw garlic or the strong flavor of cooked garlic. Unfortunately I don’t know where to buy this product. Morton & Bassett – They are a spice company that has been testing for peanuts ever since we had a huge recall of peanut tainted cumin a few years ago. They also test for gluten and after years of negative (no gluten) test results, they are now certified gluten free. They sell a premium quality product that smells fresh and looks vibrant compared to other brands. Introducing Briannas new organic salad dressings and Taste Toppers’ concentrated chicken broth. I was so happy when my friend Erica Dermer (Celiac and the Beast) found me at the Folios booth and we both marveled at their tasty gluten free, lactose free cheese wraps. Taste Toppers – Rick from Khong Guan introduced me to Taste Toppers, which are packets of concentrated chicken broth (affiliate) that we can add to our soups for extra flavor. We can add the concentrated broth into a cup of hot water for some instant chicken broth. It’s the best tasting broth, it tastes homemade without all the work and mess. They also make beef broth and bonito (fish) broth. Folio Cheese Wrap – This is meant to be a lactose free and gluten free alternative to wheat tortillas that you can use for wraps, crisp up for a snack, or shape into a cheesy tortilla bowl, or melt as a cheese topper. I love that it’s a very thin pliable layer of cheese and a brilliant gluten-free alternative to a wheat based tortilla. Brianna’s Fine Salad Dressing – They’re adding an organic line of salad dressing this spring, which include some of the popular flavors as well as some new ones. My favorite flavor is their Poppyseed dressing, it’s creamy and sweet. I also like their Cilantro and Lime dressing, it’s great with fish tacos. Ozery Bakery – I love their tasty morning rounds for breakfast, they’re like a soft pita and are so good when toasted. They have a new Blueberry Morning Round which I like very much. I’m still waiting for my local stores to carry Ozery’s new chocolate mini rounds. Choosen Foods – I was surprised to learn that Choosen Foods makes peanut oil, avocado oil, and sesame oil in separate facilities. This is great news for people who are looking for a peanut-free sesame oil. Their latest product is a flavored avocado spray to give a light application of flavor on foods such as Citrus Pepper, Lemon Dill, and Chili-Lime Ginger. I like that their FAQ has a lot of allergen related questions. Chickapea Pasta – I was super excited to try their organic chickpea and lentil pasta which is nut free, gluten free, vegan and high in fiber and nutrition. My husband who loves hummus had seconds of the pasta. One of my sons loves mac and cheese and I would love to make it a little bit healthier for him, which is I think their new Chickpea Mac & Cheese is a great option to try. I had to add a few minutes to the cooking time because we like our pasta a little softer. The first time I cooked it the sauce thickend quickly, I recommend saving 1 cup of the cooking water to make the sauce. Perfect Puree – they make fruit purees that one can use for making drinks, desserts, and colorful styling purposes. They are nut free except for lychee and coconut and there are some products which are run on separate lines from lychee and/or coconut, so if those are allergens, their customer service can help you figure out which flavors are 100% nut free. 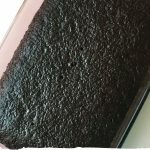 Bolani – I toast them in a clean, dry frying pan for a veggie packed breakfast for my kids. The bolani is nut free but the green sauces do contain nuts. They try to limit allergen cross contact of the sauces by making the sauces with nuts on different days from the sauces without nuts. I’m always looking for a portable protein rich savory snack rather than a sweet snack that tastes great and then leaves us feeling hungry 30 minutes later. I am always on the lookout for meat snacks like meat sticks and jerky. These are also delicious. Meat Sticks – I love the individually wrapped meat sticks for a quick snack that’s not messy at all. Both of the following brands do not use MSG, nitrates, antibiotics, hormones, and are gluten free. Nick’s Sticks – we tried the beef sticks and turkey sticks (affiliate) made from grass-fed beef and free-range turkey, no sugar, and both taste amazing. They also have spicy versions of their turkey and beef sticks. Landcrafted Foods – made from grass-fed beef, less fat. My kids like the sweet smoked flavor best and thought that the original smoked flavor (affiliate) is spicy for them (it’s not spicy). Jerky – Taste testing jerky at the Fancy Food Show doesn’t give me an accurate idea of whether they’re good or not. I think the samples dry out and become too chewy. I’m also surprised that there were some jerky manufacturers that have potential cross contact with nuts. These are my top 3 favorites. 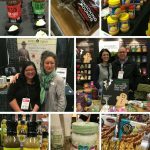 Perky Jerky – I like their jerky and buy them from Costco and I have mentioned them when I went to WFFS16. This year they’re launching a line of jerky made from wagyu beef, they are soy-free but use coconut aminos. Truffle & Thyme wagyu (affiliate) is my favorite because it has a mild flavor. Sea Salt and Pepper wagyu is a tiny bit spicier because of the black pepper and delicious. The Chimichurri flavor is the spiciest of the three flavors. Country Archer – their jerky is a great alternative for those who are allergic to coconut but can have soy. I love that they have a clear allergen statement in the FAQ so that people with food allergies can make an informed decision. They also make meat sticks and bars (affiliate) too. Deli Meat/Refrigerated Snack Packs – Portable but perishable items that you might find them at convenience stores, coffee shops, and other places you might shop for something to eat within an hour or two. Creminelli Fine Meats. All of their packaged meats are nut-free, they even have a nut free mortadella. Some of their meats are packaged into a snack kit with crackers, cheese, dried fruits, etc. and if there’s a chance of cross contact with allergens, they will label with an allergen advisory. I think that it’s a good idea to double check about any snack kits in general. I deliberately ask some semi-random questions to see what people say. Sometimes I learn something unexpected because I don’t know what I don’t know. Do you have any plans to add nuts to any of your products in the future? That question led me to find out that a company that states “made from our nut free recipe” in their marketing is thinking of adding some nutty flavors in the future. It’s actually a good topic to discuss. Are all cheeses nut-free? I asked some cheese experts and apparently most cheese makers do not use nuts in their cheese or in the facilities, except they could think of one company that makes brie with walnuts in them. It’s generally true that milk based cheese are nut free but be careful with dairy free/vegan cheese because sometimes vegan cheese is made with cashew milk or other tree nut milks. And that’s a wrap for WFFS 2019! Let me know which ones are your favorites. If you are curious to see what else have I found over the years, check out some of my previous posts from 2018, 2017, 2016, and 2015 (multiple posts in 2015). 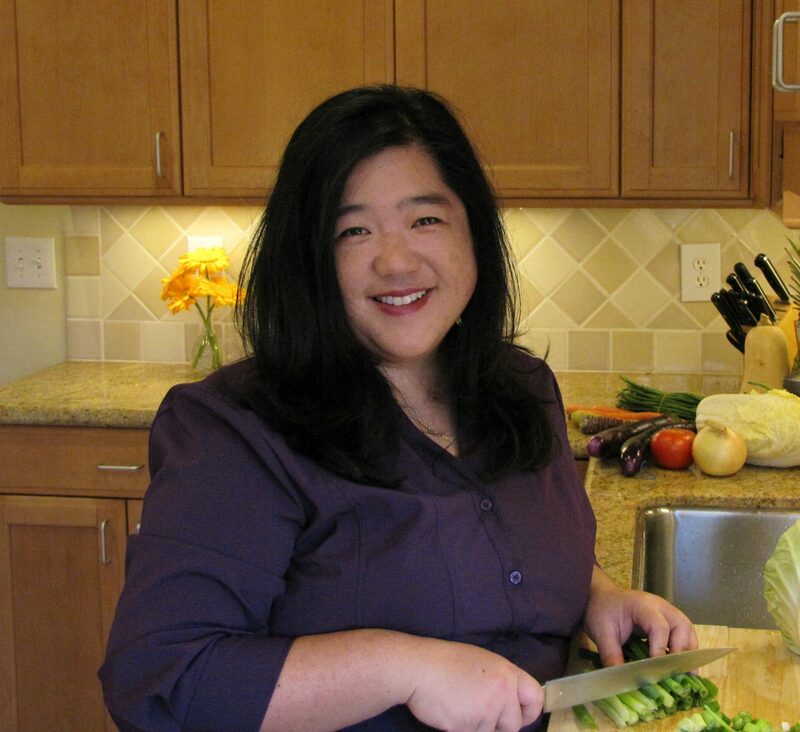 If you want to see what’s in my cupboard to make allergy aware Asian fare, take a peek to see what’s in my cupboard. Thank you for this amazing post! So many brands I didn’t realize were safe! You’re welcome! Please double check for your allergens but it’s pretty cool to have so many options to consider!